Okay before I start to waffle on about one version of paradise; desert islands surrounded by golden sand, palm trees laden with scotch eggs and waterfalls flowing with the finest real ales (sounds like my ideal holiday destination). It would be rude of me not to give you a brief introduction about myself, leading into how all this pike fly-fishing business came about. Born into the Monaghan clan of Welsh (a lot of Welsh), English and of course Irish descent some forty something years ago, the urge to pick up a rod and line came to me well before my teens. How or why it did, I cannot recollect, as not one of my relatives had the slightest bit of interest in the pastime. Undeterred and unguided in the art, a regular driver was called upon; my Dad, to ensure I was fed and accompanied to various waterways around the beautiful Wye valley. Then a few years later, after relocating, the equally interesting Thames and its tributaries. Being a creative and practical individual, well I like to believe, after some time I moved from maggot, worms and bread on the hook, to various feathers, yarns and anything I could get my hands on to tie up flies to tempt those trout. In my twenties fishing took a back seat for something else; courtship and marriage came, soon followed by messy nappies and ever increasing bills. Fishing of course became less of a priority, and it still isn’t, honest. My supportive, but long suffering wife, who is also a very good proof reader I might add and very pretty, would beg to differ on this and once said “If you put as much effort into your work life as you did your fishing, you would have travelled up the corporate ladder by now”. “Hmmm!” was my response, she was probably right, but would it have given me as much pleasure? I think not. Anyway, whilst my children were growing up and becoming a little less dependent on us both, an unhealthy nocturnal obsession with big barbel developed, entailing many regular short evening sessions; tracking them down on our pretty but challenging southern tributaries. It’s the barbel fishing I’m really known for, at least locally, but of late the spark has slowly faded. 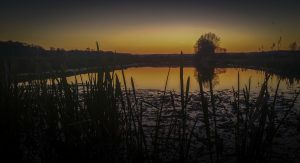 Ten or so years of chasing specimen fish sometimes up to three or four evenings a week during the seasons has become a little tiresome, especially when venues are hard and contain few, already captured specimens. 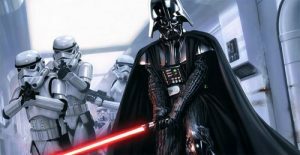 I know the force is strong, but careful with that sabre Vader! This means that the closed season is actually a welcome distraction and it’s always satisfying to feel that fly rod and to cast a fly again, during the enforced break. However, much I enjoy fly-fishing for trout – especially using natural patterns, something has changed in me, as those longer trips don’t quite hold the same intensity and excitement as they once did. Whilst fishing a team of nymphs on a local reservoir, on a blustery April day a couple of years back. I accidentally hooked and landed a small pike of about 7lb, which was a first for me. 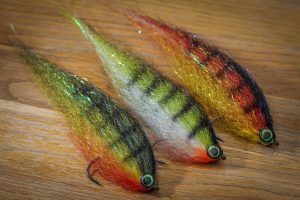 This led me to start researching pike on the fly, and thus I discovered a whole new side of fly fishing waiting to be explored. The “Dark-side” of fly fishing I have heard quoted a few times. I’m not quite sure about that, but there is certainly a growing following for catching any fish on the fly in the UK, be it coarse or saltwater fish. SWFF is on my bucket list, and if only I lived closer to the coast I’d be chasing those bass and mullet I’m sure. It wasn’t until early last year however, that I started giving pike fly-fishing some serious thought. Like a lot of anglers with families, time was a big factor, so the odd hour here and there would have to fit in around my other commitments. 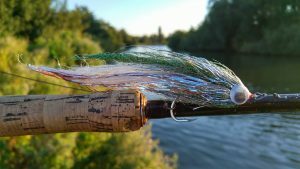 Then late summer going into autumn last year my new obsession really took hold and the fly-tying vice was dusted off and put into action once again. When you can’t fish, for whatever reason, spending hours thinking about it and getting creative is the next best thing for me personally. 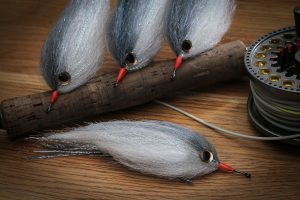 A hundred or so ties later, lots of mistakes and an emptying of my wallet for materials – some pike flies turned out alright and they even received some interest. Luckily it seems those early, but poorly tied flies, didn’t put the pike off when I chanced upon one. So don’t let that put you off tying if you are thinking about starting. 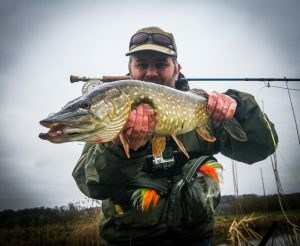 One of my first ugly pike flies, but was a favourite until recently. 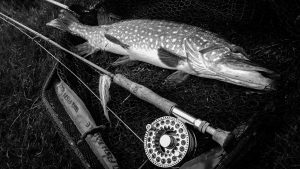 It was important that my pike fly fishing opportunities needed to be local, if I was to learn the art quickly and get my regular fishing fix. Luckily most lakes and rivers close to me do contain a few pike, but access to cast is either impossible or full of risk, as most are tree lined, or swims cut out for the carp anglers. Undaunted I persisted for an hour or two here and there, I caught a few, but never found the fish easily and lacked confidence with my presentation and fly choice, so would chop and change frequently. I desperately needed to find a water during the closed season that would give me that missing confidence, which I could then build on. A visit to the Fens for a fish and social with the Pike Fly Fishing Association http://www.pffa.co.uk/ lads prior to the end of season, was just the tonic and I was hopeful I would pick up a trick or two. I fished hard for ten hours on a muddy drain; with virtually zero visibility and catching nothing but snags and frequently losing flies. 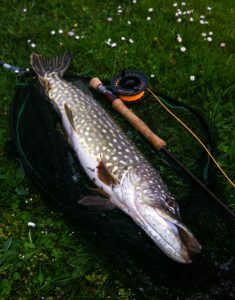 Not great fishing for me, however the local, far more experienced pike fly-fishers amongst us didn’t relent and caught a few. They were also keen to encourage me, friendly and willing to pass on helpful advice. So all in all, it was well worth the tenner I paid, to join and meet up with like minded guys and make some new friends. Afterwards I was a little down, but armed with some more knowledge, I decided to head to a very local club backwater, which has been neglected by me and the members for years. 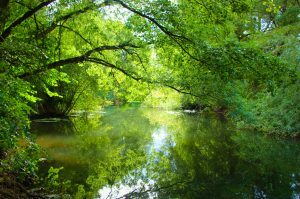 It’s an exposed, narrow and shallow water stretching for half a mile and has no flow coming into it from the river, so has no closed season. It resembles a drain and seemed an ideal place to experiment with a few flies I’d seen being used to good effect. Really it was just to see how they swam with my tying style, and to get an idea of whether this little water contained any pike, as rumour had it that it contained nothing apart from a few old carp and tench. Not put off, on my way home from work one Friday evening back in late March, I decided to have a few casts there, not expecting much. To my surprise on the second cast a pike hit my Flashtail Roach, which I unfortunately missed. The same thing happened a few more times before I had to leave for home. Excited by the prospect of finding something willing to bite, I negotiated a couple of hours fishing the following morning. I returned back to where I’d failed to hook-up, anticipating a pike to smash my fly, but nothing happened for the first hour. The morning sun was now higher in the sky and casting my shadow on the water, so I started moving to try and locate a fish, rather than hammering one spot. I covered a quarter of a mile of narrow waterway, until finally my fly was suddenly engulfed by a small jack no more than a few pounds, literally under my feet. Encouraged I worked my way back to the car and it wasn’t long before a better pike nailed the fly just under the surface. I say better, it was about eight pounds or so, but nonetheless it put a big smile on my face after a lively fight on my nine weight. I’m just happy to catch these days regardless of size. It’s the element of surprise and visual aspect that I find so addictive, watching that pike dart out close in, or seeing it follow so tantalizingly close. 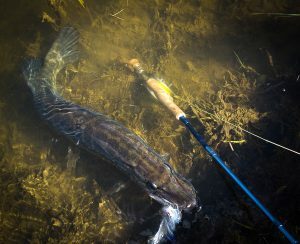 Over the last several weeks, any opportunity I have had, the pike fly gets a swim on my backwater. Be it a thirty minute cast during my work lunch break, early morning watching the sunrise or after dinner an hour before dark. Most trips something happens, be it follows, hits or landed fish, and most importantly I learn a little more with each visit and can’t wait until the next. Mornings can be more productive, evenings are a struggle until dusk. Do not ignore nearside and far bank margins. Most of my pike hits are from these areas. Wind is good, unless your partner is present. Spend time learning the depth and work your fly at various depths and pace through the retrieve, until you find something that works. My confidence fly the ‘Flashtail Roach’ suites a fast jerk and pause in water with average to good visibility. Follows can be frustrating but equally exciting. If you see one, pause and let the fly drop. I have witnessed on a few occasions now, a pike take the fly stationary once settled. If they don’t take then gently twitch it and get ready. It doesn’t take long to figure things out if you fish regularly and you stumble upon a few pike, and I’m proof you don’t have to be an expert to be successful. That desert island can do one, even if I am a lover of scotch eggs and a drink or three, as this little neglected backwater is my paradise for the next couple of months, before the rivers call again.